So if you’re a writer, tell me a story, he said. Can’t you? Did you run out of stories? Run out? They’re backed up in my head like subway riders at rush hour turnstiles. They come and go like the flashes of light in the tunnels. 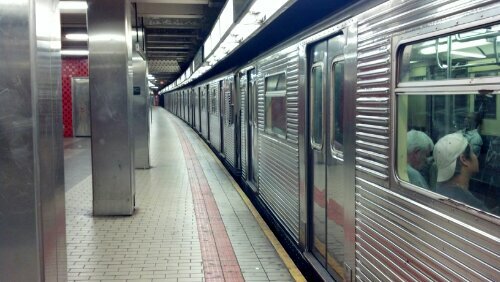 They give me sidelong, seductive glances and then are gone at the next stop, or the one after, without looking back. Dozens, dare I say hundreds, every day. That’s just it. I want to tell you all of them. What would just one mean? How can I pick? Would it be the right one? The one you need to hear. 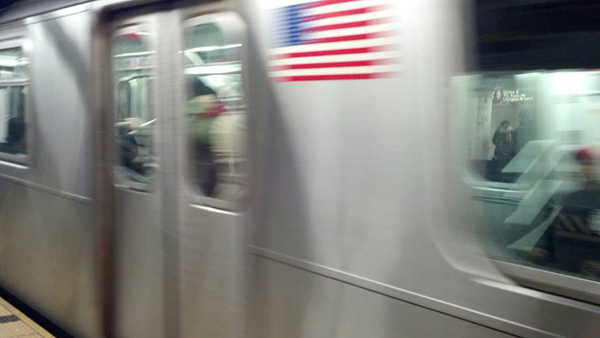 The boy laughed, a bright chattering bell above the trundle of the subway train. What if I want to hear all of them? Well. How far are you going, my friend? I’m going to the end of the line. Unfortunately the next stop might be mine, or the one after. Then you better get started. Do you want one with a moral, or do you just want to be entertained? How about one with a superhero? Ah, a little of both. Alright then. Once there was a small boy with unruly blond hair and green eyes. A green that you don’t see very often — never, in fact. Aventurine. One day his father accompanied him on a class trip. There they were on the 4 train, Sebastian, his father, his teacher, and the entire first grade class at St. Athanasius School. Across the aisle, leaning against the door reading, Sebastian saw a young man, perhaps a college student, scruffy and unkempt. Sebastian couldn’t take his eyes off this stranger, and why do you think? His eyes were the same shade as Sebastian’s. Aventurine. The sort of green you never see. The sort of green Sebastian had been searching peoples’ eyes for since he first realized exactly how uncommon they were. Are you finding this one interesting so far? I don’t know yet. Just tell it. In that order. I loathe typing on my phone – even texting or Facebook messages. It feels like the 2013 equivalent of Morse code (even swiping). But I thought I should check in since I dropped off the face of the earth for longer than usual. I haven’t been writing in the sitting down banging away at a keyboard sense, but I have in the recording everything in my head sense. I guess moving anywhere is a lot, but NYC is enormous and complicated, not to mention ridiculously paced. Decisions have to be made instantly or you get off at the wrong parkway exit and head into the Bronx in a fourteen foot moving truck. On the other hand, it’s always been one of the warmest, most genuinely human cities I’ve known. I know that flies in the face of stereotype (and it’s often well-concealed), but it’s true. You want the definition of “we’re all in the same boat,” it’s when the doors close on the 4 train and everyone from the CEO to the homeless guy is there pressed together at the mercy of the MTA. Yeah, when they get off the train they go to very different places, but in many cities they’d never end up standing shoulder to shoulder at all, ever. That’s the most amazing realization I’ve had so far…you can’t easily segregate or shelter yourself in this city. We’re all thrown in together in this jostling, arrogant and very human crowd, on sidewalks, in subways, in elevators and grocery stores. It makes for stories. I’ve had another realization…I have to get better about food shopping. The hipster grocery I’m frequenting is like food shopping at a hotel gift shop. Pricey.